It has been announced that I will speak to you on a subject which has occasioned a good deal of controversy among the people of God. I want to take as a starting point--not exactly as a text, because we shall be looking at a good many Scriptures--Romans 8:38-39: “For I am persuaded, that neither death, nor life, nor angels, nor principalities, nor power, nor things present, nor things to come, nor height, nor depth, nor any other creature, shall be able to separate us from the love of God, which is in Christ Jesus our Lord.” This is the inspired answer to the question of verse 35: “Who shall separate us from the love of Christ?” That is, once we have been justified by faith, who is there, what power is there, that can separate from the love of Christ? And the answer, how full, how clear, not a shadow, not a doubt, not a question left, when the apostle says that neither death nor life shall separate! Can you think of anything which is neither included in death nor in life? Neither death nor life shall separate! People say, “I see you believe in that old Baptist doctrine of ‘once in grace, always in grace.’” Or another says, “I understand you hold that old Presbyterian idea of ‘the final perseverance of the saints.’” I do not know why this should be called either Baptist or Presbyterian, only to the extent that Baptists and Presbyterians agree with the Book, and the Word of God clearly shows that once God takes us up in grace nothing can separate us from the love of Christ so that evidently the expression, “once in grace, always in grace,” is a perfectly correct one. But, on the other hand, I am not so enthusiastic about the other expression, “the perseverance of the saints.” I believe in it; I believe that all saints--all really belonging to God--will persevere to the end, for the Book tells me, “He that shall endure unto the end, the same shall be saved” (Matthew 24:13), and if a man starts out and makes a profession but gives it all up, he will never be saved, because he was never born again to begin with, he was never truly changed by grace divine. On the other hand, the reason he endures to the end is not because of any particular perseverance of his own. What I believe in, and what the Word of God clearly teaches, is the perseverance of the Holy Spirit. When He begins a work, He never gives up until it is completed. That is our confidence. Let me try to make that clear. Here is Adam the first, the head of the old creation, and he was placed on trial in the Garden of Eden. The entire world was represented in him--you were represented in him, I was represented in him. As the Spirit of God says of Levi, “He was yet in the loins of his father, when Melchisedec met him” (Hebrews 7:10), so we, every one of us, were represented there in Adam when the old creation was on trial. Adam failed, and God said, “In the day thou eatest thereof, dying thou shalt die.” As a result of that failure the old creation fell down in death, and every person that has ever been born in the world since that time was born down there; no one has been born up here, where Adam the first started, except our Lord Jesus Christ, and His birth was a supernatural one. Therefore, as members of the old creation we were all dead, all lost. But now see what happened--our Lord Jesus Christ came into the world (the written Word here speaks of Him as the living Word) and He stood on this plane of sinlessness. Adam was created sinless but fell; Jesus came, the sinless One, conceived of the Holy Ghost, born of a virgin mother, but He saw men down there in death, and at the cross He went down into death, down to where man was, and came up in grace from death. But He did not come up alone, for God has quickened us together with Christ, so that all who believe in Him are brought up from that place of death; and as at one time we were made partakers of Adam’s race, so now we are made partakers of a new creation. What does God do for us now? Does He put us where Adam was before and say, “Now behave yourselves, and you won’t die again”? No, He puts us up higher than Adam could ever have gone except by a new and divine creation. “He hath raised us up together, and made us sit together in heavenly places in Christ Jesus” (Ephesians 2:6), and because we belong to this new creation we can never be lost. You were lost because the head of the old creation failed, and you went down with him. You can never be lost unless the head of the new creation falls, and if He does you will go down with Him. But, thank God, He remains on the throne where God Himself has put Him, in token of His perfect satisfaction in the work He accomplished. “My sheep hear My voice, and I know them, and they follow Me: and I give unto them eternal life.” Do you believe it? I do not understand how people can read a passage like that and then talk about a Christian losing his life. It would not be eternal if it could be lost. “And they shall never perish, neither shall any man pluck them out of My hand.” The original is very strong here. In the English a double negative makes an affirmative, but in Greek it only strengthens a declaration. “They shall never, no never, perish.” It is impossible, it is unthinkable, that one who has eternal life shall ever perish. 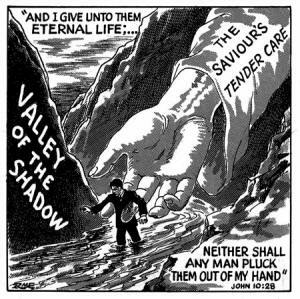 “My Father, which gave them Me, is greater than all; and no man is able to pluck them out of My Father’s hand.” Here I am, a poor lost sinner, but the Lord in grace picks me up and saves me, and I am in His hand. And now the Father puts His hand around too, and I am in the hand of the Father and of the Son, and the devil himself cannot get me unless he can loosen those hands. Could you think of any greater security than to be in the hands of the Father and of the Son? “Never perish,” “eternal life”--what wondrous words are these! Do not be afraid of God’s truth. You might as well be afraid of the beginning of the gospel that God can freely forgive and justify a guilty sinner by faith in the Lord Jesus Christ. People try to put guards around that truth and say, “Yes, you are justified by faith if you have enough good works to add to it.” That is not true. It is by faith alone, and good works spring from that. When you know you have eternal life, you will find your heart so filled with love for Christ that you will try to live for His glory. Is it not strange for anyone in this dispensation of grace to quote a passage like that, as though it had anything to do with the question of the soul’s salvation? Go back and read Ezekiel 18. Of what is it treating? We read in verse 21: “If the wicked will turn from all his sins that he hath committed, and keep all My statutes, and do that which is lawful and right, he shall surely live, he shall not die.” Is that grace? No, that is law. That is just the quintessence of law. Do you believe that if a wicked man turns from his wickedness he will live? If this is true, why did Jesus die? Would you preach that to sinners? Would you have me stand up and say, “You wicked people, you have been doing wickedness; you start in tonight to do righteousness and you will live”? Would you have me preach that? I would be deliberately deceiving people if I told them that. But you see, here God was testing people under law and said, ”The man that doeth these things shall live. . . .But when the righteous turneth away from his righteousness, and committeth iniquity, and doeth according to all the abominations that the wicked man doeth, shall he live? All his righteousness that he hath done shall not be mentioned in his trespass that he hath trespassed, and in his sin that he hath sinned, in them shall he die” And what has happened? Not one man ever continued in all the things that are written in the book of the law to do them. Therefore, they were all under sentence of death. How then were they to be saved? By turning over a new leaf? Oh, no--but by confessing that they had no righteousness. If they had, it would only be filthy rags. But now they find all their righteousness in the Lord Jesus Christ, “who of God is made unto us wisdom, righteousness, sanctification, and redemption.” Do not ever quote Ezekiel 18 as though it were gospel; it is law. And remember the “life” spoken of in Ezekiel is not eternal life in Christ. It is life here on earth prolonged under the divine government, because of obedience, or cut short because of sin. Watch this carefully. See if I read it correctly. “For it is quite possible for those who were once enlightened, and have tasted of the heavenly gift, and were made partakers of the Holy Ghost, and have tasted the good word of God, and the powers of the world to come, if they shall fall away, to renew them again unto repentance; seeing they crucify to themselves the Son of God afresh, and put Him to an open shame.” Is that what it says? You believe that a man can be once enlightened, made a partaker of the Holy Ghost, can taste the good Word of God and the powers of the world to come, but fall away and then repent--don’t you? That is what all the folk believe who do not believe in the eternal security of the believer. What are you going to do with your backslider? If backsliding and apostasy are the same, don’t you see this passage is the worst possible passage in all the Bible for their favorite doctrine? Here is this Hebrew who has followed along to a certain point, and now the question comes, “Will you confess this Christ as your one great sin offering no matter what it means?” And he answers, “No, I cannot do that. I am going back to the temple. There is a sin offering there, and I will not have to suffer as I may if I confess Jesus Christ.” But he cannot do that. God does not accept any more that “there remaineth no more sacrifice for sins.” “If we sin willfully after that we have received the knowledge of the truth, there remaineth no more sacrifice for sins.” “There remaineth no other sacrifice for sins: is the true meaning. This sacrifice at the altar was commanded by God. He said, “If you sin, you must bring a sacrifice, and I will accept you.” “The life of the flesh is in the blood: and I have given it to you upon the altar to make an atonement for your souls: for it is the blood that maketh an atonement for the soul” (Leviticus 17:11). “All right,” this Jew says, “I have a sin offering.” But he has met Jesus Christ or heard of Him as the great sin offering; he knows that God accepted Him and raise Him from the dead; he has all this knowledge, but having it all he is afraid to come out definitely and confess Christ as his Savior. He says, “I do not need this sin offering; I will go back and be content with the sin offering of the temple.” Before Jesus came, that was acceptable because it pointed to Him, but now He has come. If you reject Him, there remains no other offering. This passage, you see, has nothing to do with a real Christian turning from Christ, but with a man thoroughly instructed who refuses to accept Him. And how many people there are, not only among the Jews but in Christendom, who are refusing this sin offering. What a terrible thing it would be if this were the way into heaven! How many thousands of earnest Christian people there are who have allowed what they thought was their responsibility to their friends to keep them from fully following Christ. Suppose they went to heaven only on the ground of fully following Him. You see, these Jews were looking for the kingdom, and many said, “I will follow Thee, but my friends have a claim on me.” “No, the Lord says, “I must come first. No man, having put his hand to the plough, and looking back, is fit for the kingdom of God” That is the test of discipleship. But it is necessary to distinguish between salvation by grace and reward for faithful discipleship. The rewards are connected with the kingdom. No matter how faithful I may be as a Christian, it does not give me any better place in heaven than if I were taken there the moment I was saved. Suppose the very instant you were converted you dropped dead--would you have gone to heaven? Yes, you would have gone there on the ground of God’s delight in the work of His Son. Suppose you were converted fifty years ago. There have been ups-and-downs in your life, but you have been saved all those years. Where would you go if you died suddenly? You would go to heaven. On what ground? On the ground of God’s delight in the work of His Son. There is not a bit of change in fifty years. “But,” you say, “I have been a wonderfully faithful Christian.” Have you, indeed? I am surprised that you should think so. The more we serve Him, the more most of us feel how unfaithful we have been. But you insist, “I have been a very faithful Christian.” Does that make you any more fit for heaven than you were the moment you trusted Jesus? You ask, “Does faithfulness as a disciple go for nothing?” It goes for a great deal, but it has no saving merit. You have a place in the Father’s house on the ground of pure grace, but the Father’s house is not the only thing before us. There is also the kingdom of God. “Then shall the righteous shine forth in the kingdom of their Father.” And here there are different rewards according to the measure of faithfulness in this life. Is this an individual who has once been saved and is so no longer? The Lord is talking to a church. Did you ever see a church like the one at Laodicea, a church neither hot nor cold, one where you could not tell whether it was for Christ or against Him? And then the Lord says to that church, “Because you are just lukewarm--there is profession--but you are neither hot or cold, I will spit you out of My mouth. I won’t own you as a church at all.” That does not say that there may not be individuals in the church who are children of God, just as in the church at Ephesus. He said to them, “If you do not repent, I will remove your candlestick.” A candle, you know, is to give light. No Christian will ever have his name blotted out of the Lamb’s book of life, for all such have eternal life--which is unforfeitable and everlasting. 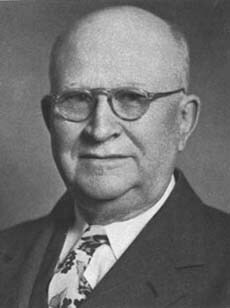 H. A. Ironside went to be with the Lord on January 15, 1951. Throughout his ministry, he authored expositions on 51 books of the Bible and through the great clarity of his messages led hundreds of thousands, worldwide, to a knowledge of God’s Word. His words are as fresh and meaningful today as when first preached.